Siorapaluk is the northernmost village in Greenland. Hunting and fishing are regulating the fifty three inhabitants' life, and giving them most of their food needs. In addition, a supply ship is coming only once a year. We are happy to meet again with Jocelyne Ollivier-Henry, a friend from Brittany, she has been living here part time for the last thirteen years. She showed us her village, and we invited her on board with her friends, and a flock of children! After two days stop, Greenlandic that came with us from Qaanaaq to visit their cousins at Siorapaluk, are coming back home with us. Coincidence: Siorapaluk is at the same latitude than Inglefield Bay, in Svalbard, where Vagabond spent five winters (2004-2009). About Inglefield Land, here in Greenland, we will approach it next week. 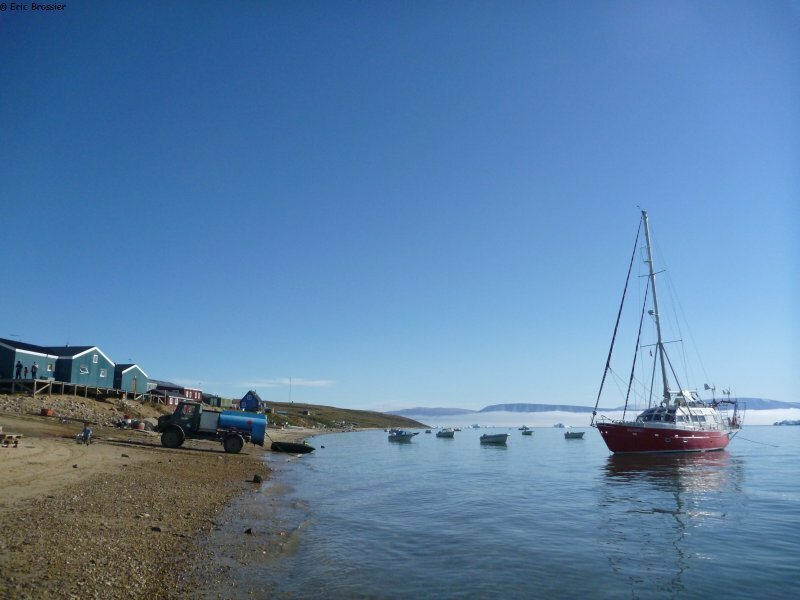 Back to Qaanaaq, Vagabond beaching capacity is used to enter the lagoon, at high tide, and to beach to get diesel.